The majesty of afternoon tea. No need to shell out megabucks in a fancy hotel for this refined pastime. Tea time is one of the simplest ways to entertain. It can be casual or swanky, and the guest list can range from family, friends and neighbors to members of a volunteer group or book club. It’s a wonderful way to get together on a winter evening (think rain, snow and ice outside, warm and cozy inside.) Pull out that rarely used wedding china, cake stand, flowered ceramic serving tray or whatever else is hidden in the cupboards. This is your opportunity to get a little extravagant with what you already have around the house. Think “Downton Abbey” tea right at home. Teatime can be anytime in 21st Century living, based on the tradition set by the Duchess of Bedford in the 19th century, who decided it was much too long between lunch and dinner to go without a snack. So she ordered a light repast of Lapsong tea, scones and cakes to hold her over. The “meal,” by the way, is not confined to adult entertaining. When it’s an early school closing or days off for the kids and they want something productive to do, let them try their hand at this basic style of cooking. Then they get to eat their creations in a civilized fashion. They can make elegant-looking peanut-butter-and-jelly, egg- and tuna-salad sandwiches, pressing the bread for a thin, crustless finale, just as British royal Princess Charlotte might do. And kids love to pat out the sticky dough for scones. Scones, the real British variety, are moist and spongy inside, and crunchy-crisp on the outside. Made with inexpensive ingredients — flour, butter and sour milk — they could be mixed and baked in minutes, and were served in both farmhouses and mansions. The triangular Petticoat Tails, or four-ingredient shortbread cookies, are said to resemble the long, frilly underskirts of 16th-century ladies. In the Shetland Isles where I grew up, a round shortbread cake was broken over a bride’s head as she entered her new home. The rich, buttery, cookie-inspired one Scottish chef called “shortbread” became the “jewel in the crown” of Scottish baking. As for tea, the dry, aromatic leaves were scarce, expensive and highly taxed. British housekeepers kept it in a locked box, attaching the key to one’s belt so that it could be doled out as needed. Sandwiches, scones, shortbread and that precious tea — an elegant, easy, but necessary afternoon revival. *Make sandwiches 4 hours or so ahead of time. Cover loosely with a damp paper towel to prevent drying out and refrigerate. 1. Pile 10 slices bread on a cutting board. Remove crusts. 2. Place five slices flat on the board and spread thinly with cream cheese. 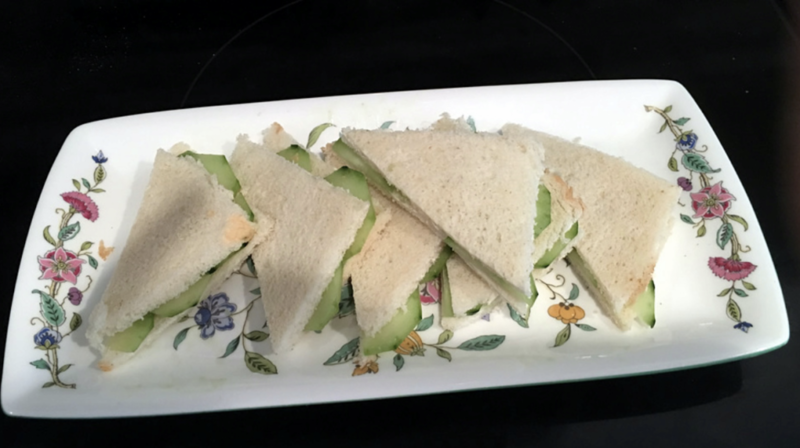 Top with a layer of cucumber slices, then cover with remaining bread slices. 3. Press down with your hand. Cut each sandwich into two triangles. Repeat with remaining bread. Arrange on serving platter. 4. May garnish with sliced cucumber (optional). *No self-rising flour? Substitute 2 cups of all-purpose flour, plus 4 teaspoons baking powder. *Line a baking sheet with aluminum foil. Discard foil after baking. *Butter should be cold, not soft. *For sour milk, pour in 2 teaspoons white vinegar to 1 cup milk. Let stand 15 minutes. Do not stir. *Use thin latex gloves on hands to rub butter into flour. No need to wash the food processor. 1. Place rack in middle of oven. Preheat oven to 425 degrees. 2. Line a baking sheet with aluminum foil and sprinkle lightly with about 1 tablespoon flour. 3. In medium bowl, rub butter into flour to consistency of coarse crumbs. If using plain flour, stir in baking powder. 4. Make a well in center. Add enough sour milk to make a soft, sticky dough. Turn onto a well-floured board. Pat into a round circle about ¾-inch thick. Use a little more flour, if needed. Cut into rounds with a fluted 2-inch cookie cutter. Place on prepared cookie sheet. 5. Bake in preheated oven 10-12 minutes until well-risen and golden. Remove to towel-lined basket. Cover with towel. Best served immediately or within 2 to 3 hours of making. 6. Leftovers may be split, toasted and spread with preserves. 2. Spray a jellyroll pan or Pyrex baking dish, approximately 11×14 inches, with nonstick baking spray. 3. In a medium mixing bowl using an electric hand mixer, beat sugar and butter until well-blended, about 1 minute. Add the flavoring, then the flour, about 1/2 cup at a time. 4. Beat well until the flour is completely blended before adding the next 1/2 cup flour. Mixture will be stiff. 5. If using ginger or currants, work into the butter mixture with a wooden spoon. Press into prepared baking pan. Sprinkle with cinnamon-sugar (optional). Prick all over with a fork. Bake in preheated oven, 30 to 40 minutes, or until golden and edges are slightly browned. 6. Cool for about 10 minutes before cutting into squares. Cut each square into 2 triangles. Cool completely before storing in airtight container at room temperature. May be frozen. Ethel G. Hofman is a widely syndicated American Jewish food and travel columnist, author and culinary consultant.